How to import and edit MKV files in Premiere Pro? I downloaded some 1080P MKV movies from website, and I plan to edit the .mkv movie in Premiere Pro CC, but I can't load my MKV videos into this editing software. The collection were saved in my computer D disk, after run Premiere Pro CC on Windows 8, I click "Files > Import..." and locate the file folder. It's a pity, it's empty. Why? The MKV is an open standard free container format, a file format that can hold an unlimited number of audio, video, subtitle tracks or picture in one file. This format offers a richer media experience than any other current format, this makes MKV a popular choice for making back-ups of DVD and Blu-ray discs that you could also play on a computer connected to a TV. Many editing software users needs to edit MKV files, but their program doesn't supports MKV importing, Premier Pro is one of them. How to let Premiere Pro read MKV files? Perhaps some Adobe program users want to download Premiere Pro MKV plugin, but there isn't MKV plugin for Premiere Pro CC/CS6/CS5. So Acrok MKV to Premiere Pro Converter will be a great help. 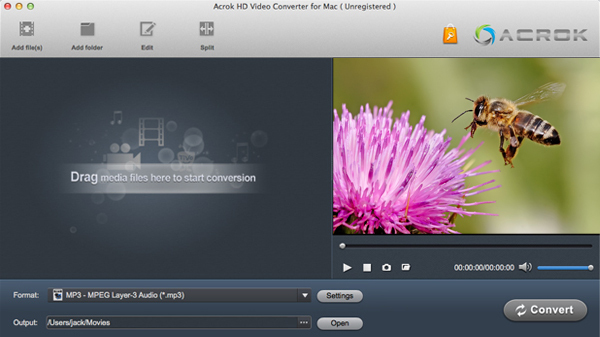 Acrok HD Video Converter (Windows Version | Mac Version), as the best Premiere Pro MKV Converter, which can convert MKV video to Premiere Pro CC/CS6/CS5 supported formats on Windows and Mac. In addition, you can convert MKV to popular tablets, Smart TVs, smartphones best playback video format. And you can convert 2D MKV to 3D MP4/AVI/WMV/MOV for playing on 3D media players and TVs. - Convert MKV for iPad Air, iPhone 6, Galaxy Tab S, Nexus 8, Surface Pro 3, etc. How to convert MKV to Premiere Pro CC/CS6/CS5 video format? Here the detailed way to convert MKV files to Premiere Pro supported formats on Mac OS X (including OS X 10.6, 10.7, 10.8 Mountain Lion and 10.9 Mavericks) is showed. The way to transcode MKV to Premiere Pro video/audio format in Windows (Windows 8) is the same. Just make sure you've downloaded the right version. Launch the .mkv video conversion software on Mac and click Add File to load the MKV files you want to convert. Or directly drag MKV videos to the MKV to Premiere Pro Converter. After the files are loaded, you can preview them and take snapshots of your favorite video scenes. If you want to convert multiple MKV files to a single file, simply click the "Settings" button then check "Merge all the file into one" to combine all added .mkv files. Some video editing functions are provided, letting you personalize your original MKV videos instantly. To edit a video, click the Edit button to open the video editing window. 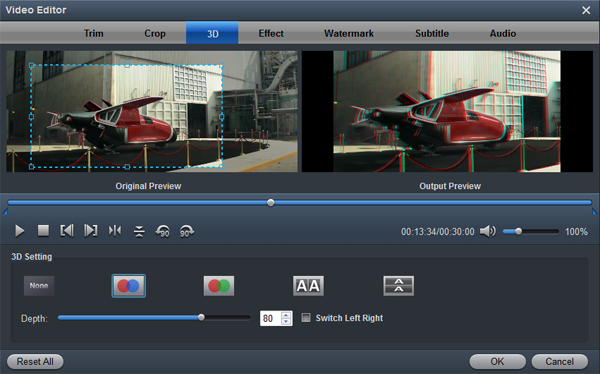 And then you can trim the video, crop video size, add some special video effects, add watermarks and more. If you want to get 3D videos, you can click "3D" to add 3D effect onto loaded MKV videos. Afterwards, navigate the formats at the bottom and click Editing Software to select Adobe Premiere/Sony Vegas MOV (AVC)(*.mov) as the output file format. Other popular output formats included MP4, WMV, AVI, MPG and many more. When all the settings are OK, click the Convert button to start converting your MKV files to Premiere Pro editable files on Mac. When the conversion completes, you will get high quality MOV videos by clicking "Open" button. 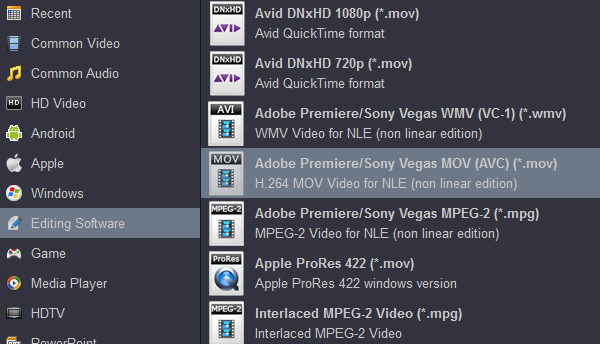 After that, you can edit all the MKV videos in Premiere Pro CC/CS6/CS5 to meet your multimedia needs. 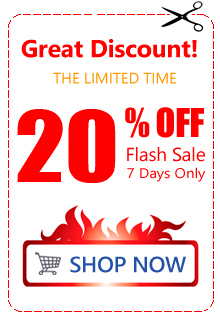 Powerful video converter for converting HD footage and movies. The editing software profiles are useful. They are easy to select and the output quality is well. This as a great piece of software easy to use with great results.